Japanese Episode AG 175: "Harley and the Rocket-Dan! The Formation of a Villains' Alliance!?" American Episode 445: "New Plot, Odd Lot!" With the Kajinoki Pokemon Contest coming up, Haruka has her pokemon get a checkup at the Pokemon Center. While there, Haruka learns that the upcoming Contest will be the last Contest before the Kanto Grand Festival! As Haruka tries to deal with this added pressure, Harley appears out of nowhere to tease his rival. After learning that Harley already has the five ribbons necessary to enter the Grand Festival, Haruka vows to win the Kajinoki ribbon so she can beat Harley at the big event. As Haruka trains harder than ever, Harley meets up with Musashi, who is also training for the Contest. He decides to lend Musashi his pokemon and says that he'll help her beat the Coordinator that he hates so much. The hour of the Contest eventually comes, and Musashi and Harley's Noctus are able to impress the judges with a combination of Needle Arm, Cut, and Cotton Spore. Haruka's turn comes up, but the young trainer and her Wakashamo have trouble pulling off their moves! 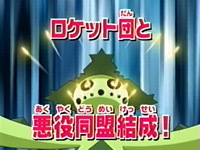 Satoshi's Pikachu, who had been watching the Contest from the audience, notices a thread-like shimmer above the Coordinator and runs off to investigate. Eventually, it is discovered that Kojioru and Nyasu, along with Harley's Ariados, are using spider webs to get in Haruka's way! The Rocket duo is quickly taken care of, enabling Haruka to salvage the rest of her Appeals round. Before long, it is announced that both Musashi and Haruka have made it to the second round! Can Haruka pull through the battle rounds and achieve her fifth Kanto Pokemon Contest win or will Harley's tricks get the best of her? To be continued! Haruka's final Pokemon Contest in Houen was against a Rougela trainer who thought she was trying to move in on her man. Haruka's final Pokemon Contest in the Kanto Battle Frontier, however, is against Musashi and (indirectly) Harley, a rival from before even Eriko's time. No new Coordinators, no new rivals, nothing. At the risk of sounding redundant...that's one of the things I really don't like about the Battle Frontier Contest arc. Houen gave us great rivals like Grace, Kimimaro, Tsukiko, and Eriko (not to mention Shuu and Harley), while Battle Frontier only gave us Ogata and Wakana. Making Musashi the rival for Haruka's final official Contest of the series is kind of lame especially since the Rocket-Dan member's never won a Contest before. How are we supposed to take her seriously as a rival if she loses every Contest she enters? The dubbed version keeps a measly three pieces of music. HOWEVER, one of the pieces is the Pokemon Contest theme! As in, the Pokemon Contest theme that's been heard in every single Pokemon Contest (in the Japanese version) since the very beginning of Advanced Generation. Why it took 173 dub episodes to finally play this tune is something I'll never understand. Ariados keeps its Japanese voice. In the Japanese version, Harley calls Haruka's friends "the Haruka Boys" (za Haruka boizu). In the dub, he calls them her "boy toys" instead. Also, Harley, in the Japanese version, uses quite a bit of English. In the English dub, he uses a few French terms (tête-a-tête, malaise, très bien), so I guess that's PUSA's attempt to translate that weird little character quirk.